A 2016 A Hardy Welcome by the New Hardy Players. 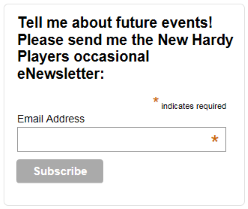 A Hardy Welcome by the New Hardy Players. Max Gate comes to life as Mr Hardy entertains in the dining room, while the domestic staff gossip in the kitchen. The Hardy Players rehearse in the bedroom, and Emma reflects in her attic boudoir; and all the time, and old country tune drifts through the corridors…..
Space limited , early booking advised. Tickets from Dorchester TIC 01305 267992.